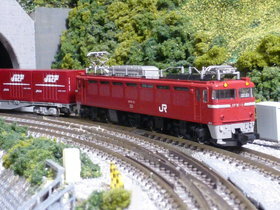 Tomix N gauge model (Tomix catalogue number 2194) of a JR EF81 Bo-Bo-Bo dual voltage (AC/DC) electric locomotive. This is a limited edition model released in ca. 2009. No product information available on the main Tomix website.